Class projects in urban planning often couple current issues in the field and departmental objectives. 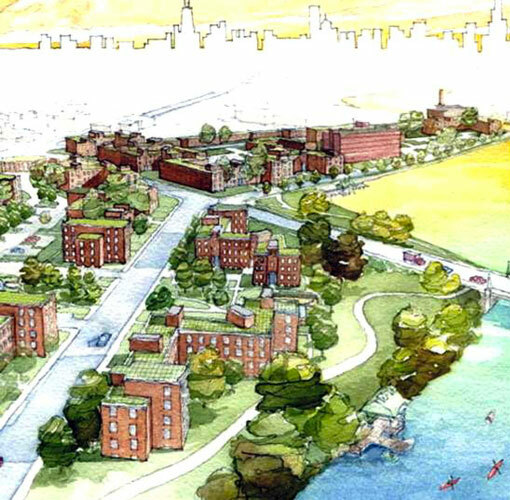 When redevelopment of the Julia C. Lathrop Homes was proposed, students were asked to take into consideration the needs of the current residents while balancing the economic and social benefits of suggested changes to diversify the community and generate income. This assignment was part of the department's Chicago Initiative, which encourages collaborative work in a major urban environment, links students to alumni and other professionals in the area, and opens possibilities for future internships and jobs. Detail from a plan by Heidy Valenzuela.